Packed with lush forests, rolling hills, and millions of acres of farmland, Pennsylvania is a great U.S state. It is home to the most prominent metropolitan cities of Harrisburg, Pittsburgh and Philadelphia. Also known as the Keystone State, Pennsylvania has a number of top-ranked academic institutes that offer programs in a variety of area of study. A wide variety of programs are offered by nursing schools in Pennsylvania. Some of them offer an associate degree in nursing while others allow students to enroll in bachelor and master's degrees. Ph.D. programs are also available. In addition to traditional nursing schools, there are also several online nursing schools that offer degrees and certificates in this field. Students can also enroll in hybrid programs depending on their suitability, completing some courses in traditional classrooms and others online. The distance learning programs can be very useful for working nurses seeking advanced credentials to improve their career prospects. The curriculum in the nursing programs includes both classroom instruction as well as practical training. Students are provided with a chance to get hands on training in clinical settings. 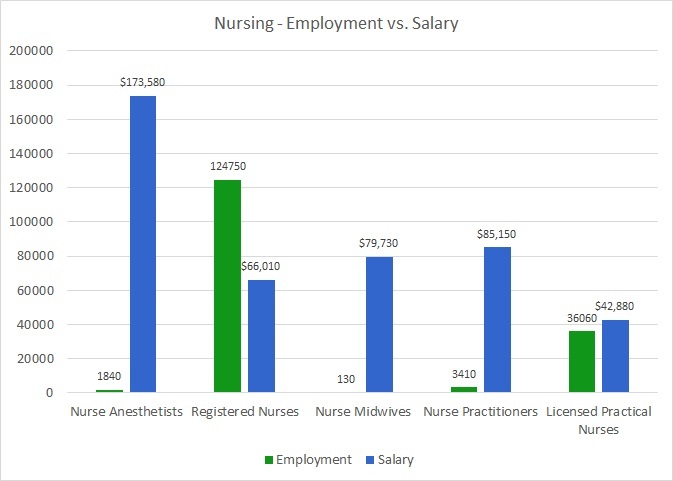 This chart clearly shows that the nurse anesthetists in Pennsylvania earned the highest salary for all the nurses in the state. Nurse practitioners (NPs) came next in the nurse salary hierarchy, while LPNs came last. If you want to be a nurse in PA then consider becoming a nurse anesthetist first before considering other options. Q:How do I decide among the different nursing schools in Pennsylvania? A:There are a number of factors that you should be considering, while deciding among the different nursing schools in Pennsylvania. Make sure that the school you choose is accredited and offers you a degree according to your desired career. Keep in mind the location of the school and see if the school offers some online courses. Also check the school's passing rate for NCLEX exam. Find out if the school has the rotational programs for nurses, as they help in developing different nursing skills. Q:Can you tell me about some pre requisite courses of the master's degree program in the top nursing schools in Pennsylvania? A:The master's degree program from the top nursing schools in Pennsylvania may require you to pass the following courses. These courses include general chemistry, microbiology, human anatomy, human physiology, human pathology, lifespan growth and development, abnormal psychology, human nutrition, and inferential statistics. Pre requisite coursework is generally accepted if it is completed from an accredited college or university. There are also a certain grade requirements for the pre requisite courses.